I’ve been wanting to switch it up on the races this year. I skipped Throo The Zoo last weekend. I’m glad I did because the runners got soaked in the rain! I’m always mindful of my running budget too. A $20 entry fee is a no brainer if it’s an event I want to do. People often ask me, “Do you have to pay to run those races?” They begin to understand when I explain the race swag, food, beverages, shirts, medals and overtime for police escorts. After my last two races being half marathons, I wanted to do a speed trial and attempt a personal record. I only told a handful of people about my PR goal and I thought about the accountability I owed to them all. Sometimes I share goals, and other times I do not. Packet pickup was at Ken Combs Running Store. I have never been there and I was impressed with the variety of merchandise. 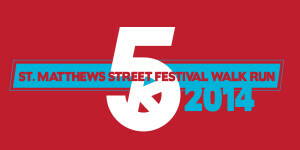 The St.Matthews Street Festival 5k race shirt was a nice change from the typical neon colors. Race morning weather called for low winds, partly sunny, low humidity and 48° at the race start. Perfect! The St.Matthews Baptist Church parking lot had plenty of spaces available when I arrived about 15 minutes before start. There were signs leading to the restrooms inside the church. I took a look around and it’s a place I would like to visit for service. Around 7:55, we were told to head towards the start line. I jumped about 3 rows back from the timing mat. I spoke to Lynn Reidling who I totally admire. At the age of 52, she places overall 1st for nearly every 5k in the area. At 8:00, we were told there was a wiring problem with the mat and the start would be delayed for a minute or two. I was glad because my Garmin was taking forever to get a signal. Some runners did run ups but I was warmed up from a light jog around the church. 8:03 is the time we started and I got a gps signal. Perfect timing. I felt strong at the start as I took my first turn. I passed Lynn but I knew the lead would be short lived. She has a short stride and swings her arms low around her belly button. Regardless of her style, Lynn gets down! Needless to say, she passed me in a half mile. Lynn’s fast feet didn’t damper my spirit. I did a double take when I saw 6:34 for my first mile split. The course followed a residential route and there was a water stop at the half way point. We had several elevation changes on this short course. Mile 2 took forever to reach. My Garmin finally beeped at a 7:22 split. I knew I had to hold tight for a PR. I thought about the work I do in spinning as I owned the last hill. I was passed by 5 guys and I was OK with that. A volunteer announced: #3 Woman! I thanked her and I saw 2.65 on my Garmin. I thought about the 8.0 speed I finish my treadmill runs with, and I knew I had it in me to slay this last half of mile. I was looking for the street Grandview. Where is Grandview? I make a turn and I see the church! 21 minutes and some change was on the digital clock. I sprinted to the finish as I showed no mercy towards 3 of the 5 guys from earlier. My previous record was 21:52 set in December 2013 down in Florida. I am so happy to report my official results! 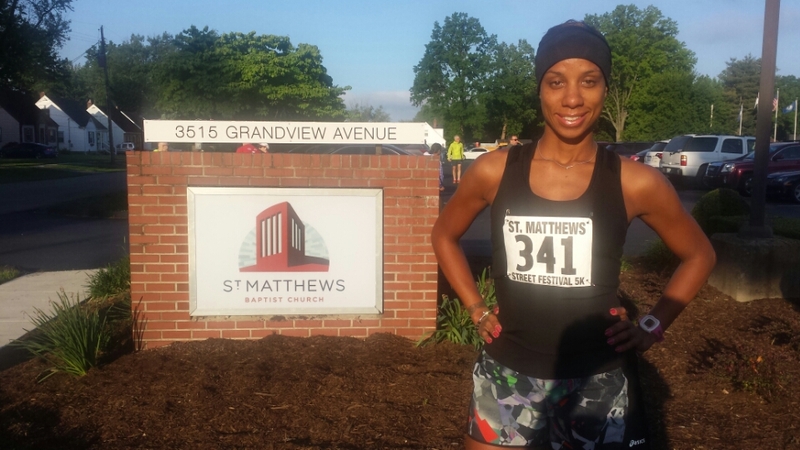 A 32 yr old mother placed 1st with a 19:06 time. She didn’t stick around for awards because she had to take her child to t ball practice. Lynn finished at 20:45. She came over to congratulate me on my fast start and compliment my form. Those words meant a lot coming from someone with so much pizazz. Lynn runs marathons also, so 5k isn’t her only specialty. I needed this PR as a confidence booster and to remind myself that I am fast. I can and will get faster. I plan to transfer this speed to a faster pace in the longer distances. Speed work, hill work, more weights, cleaner eating, continuing to spin, yoga and plenty of rest is the regimen I will follow. 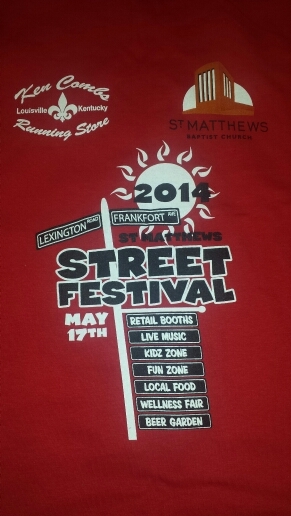 This entry was posted in fitness, Louisville, running and tagged 5k, PR, St.Matthews Baptist Church Street festival. Bookmark the permalink. Holy crap woman you are fast! Nice job!! You are amazing. I dream of being that fast…but these little legs just don’t fire like that. i try. Forget speed work, girl…you got that down. Endurance…that’s the key to longer runs! 😀 You are an inspiration. If you could pass some of that speed on to me…I’d be in heaven. Girllllll, you’re doing 1/2 marathons in my 10k time Ms.Speedy! You’re joking. I’ve never run a 10K in 40 minutes like you have. I have to shave 5 minutes off my time to hit that. It ain’t happening. 😉 The thing is…I’m not built to be fast…I’m built more for endurance races. The problem is…I want to be fast…er. LOL! I just don’t know if these legs will ever be capable of it. 😉 Help me get speedier…and I can help you with the endurance part!! I don’t get tired in longer races. It’s so weird. We’ll just have to push each other! I have 1 more 5k next weekend, then I will be ready to train with you guys the following weekend! Awesome. I’ll be back for the following weekend. I’ll text with the meet-up time! Nice Job! Congrats! I’m hoping to PR a 10k next weekend. We’ll see! Thank you! 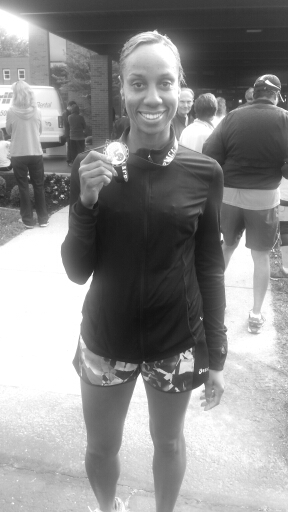 Whew 10k….my least favorite distance. Its tough to hold a fast pace for that long! I’m sure your track practice will help. Good luck! Thanks, yeah, it was a groupon deal, so I signed up. I’ve only done 2 10k’s and I remember how much they hurt. I hope the track work will translate! Can’t pass up a deal! I’m sure you can pull it off. Race day is more mental if well trained. Congrats, KelsieLou! So happy for you! You look great!